The insert for this bird feeder has been adapted from an art glass window sketch study by Frank Lloyd Wright for the Darwin Martin House. 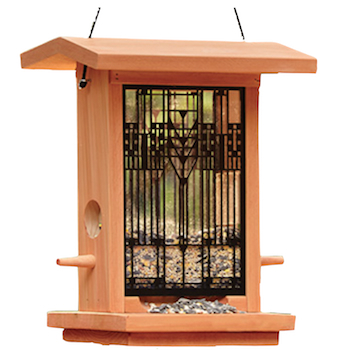 The pattern reflects through polycarbonate plastic windows in this cedar, hopper style bird feeder. 12"h x 10"w x 6-1/2"d.